Choose your age-graded category according to your actual age on RACE DAY, July, 13th 2019. Choose this option if you wish to transfer your 2019 Crusher entry to another racer. STOP! PLEASE READ THE STEPS BELOW. If you unsure about the entry transfer process, please read the "Entry Transfers on Athlete360 PDF" found on the left side of this page. Fill out the "Transfer From" fields with the ORIGINAL racer's information. Fill out the "Individual Information" with the information of the racer RECEIVING the transfer. Only the person who pays for the entry transfer will receive an email receipt. Please forward a copy of the Athlete360 receipt email to the other party as proof of purchase. Entry transfers appear in the Registration List/Roster under the Entry Transfer item. Entry transfers get moved into the race roster periodically. Once an entry transfer is moved into the race roster, the names are no longer visible under the Entry Transfer item. 100% of the funds raised from these entries will go to the Beaver and Piute County Children's Justice Centers. 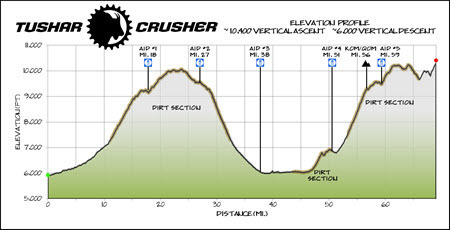 Event description: The 9th annual Crusher in the Tushar is a 69.9 mile, point to point, mixed-surface smorgasboard consisting of tarmac, gravel and dirt roads. Featuring 10,000+ feet of "lift" including a traverse of one of Utah's highest and most scenic roads while reaching elevations nearing 11,000 feet! 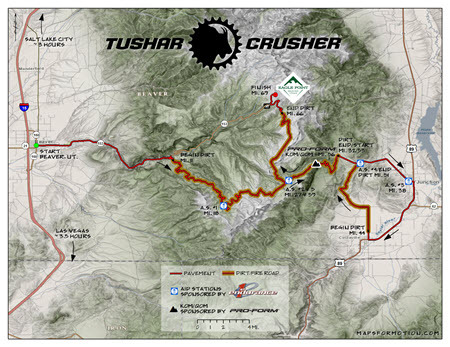 Starting in Beaver, Utah and finishing at Eagle Point Resort, the Crusher explores the stunning back country of Utah's little-known Tushar Mountains and Fishlake National Forest. Riders can choose any type of bike they deem suitable for the course with one caveat: you cannot change bikes at any point during the event. Come see what the fuss is about. It's road+dirt! event "schwag" bag, post-event lunch, awards and prize giveaway at Eagle Point Resort and prizes for category winners including a generous cash purse with equal payout for the Open/Pro Men and Women and over $40,000 of partner prizes for our age-graded categories. Please verify that your "Billing Address" matches the billing address on your credit card statement. Entering an incorrect billing address is the #1 reason transactions are DECLINED on Athlete360. Your browser may autofill incorrect data into your entry form. Please verify that your data is correct. You may want to clear your browser's cache. Check the check box next to Temporary Internet Files.